The world is a mess and bestselling author and comedian Tara Flynn is raging. Well, sometimes. Mostly she’s shocked, bemused, irreverent and wondering where the kindness went. The world is a mess and bestselling author and comedian Tara Flynn is raging. Well, sometimes. Mostly she’s shocked, bemused, irreverent and wondering where the kindness went. Depends on the week, really. ‘Rage-In’ is a collection of essays providing a personal look at our modern world. Written in Tara’s distinctive voice – conversational, witty and easy to read – we are guided through many of today’s major issues, be it Emperor Trump, Brexit, an imaginary bunker for the impending apocalypse, trolls, being a Feminazi, or how pastels are actually THE WORST. 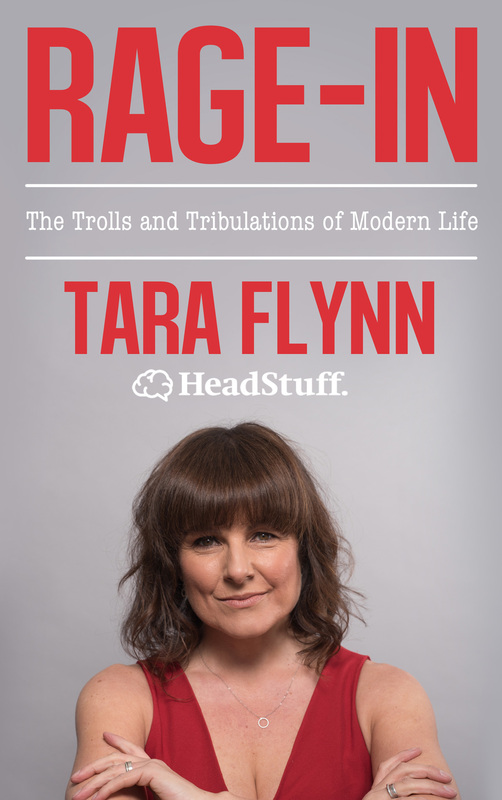 With humour and empathy – as well as the occasional bout of rage – Tara Flynn tackles modern life and wonders whether anger is really the best way to survive it. Tara Flynn is an Irish actress, comedian and writer. Originally from Kinsale, Co. Cork, she is the author of two previous satirical books, ‘You’re Grand: the Irishwoman’s Secret Guide to Life’ and ‘Giving Out Yards: the Art of Complaint, Irish Style’. Her TV appearances include roles in ‘Moone Boy’, ‘Line of Duty’ and Stewart Lee’s ‘Comedy Vehicle’. She was also the voice of ‘Our Tara’ in the Irish reboot of the show ‘Blind Date’. She was a core member of Dublin Comedy Improv for many years and a founding member of comedy group The Nualas. She has also been a columnist for ‘Irish Tatler’ and ‘HeadStuff’, and is a regular contributor to ‘The Irish Times’.